On Friday night I took my kids trick or treating for the first time. They're not three and four years old. My boys are eight and ten and my eldest daughter is twenty. She had never been trick or treating before. My youngest daughter, Samantha, preserved the family's salvation by staying home and passing out gospel tracts with the candy that we gave to 100 plus kids. Amazingly I did not awaken Saturday morning with an unnatural desire to sacrifice an animal, dance in front of a fire or worship satan. Whew. That was a close one. This year I began to ask myself early in October, Why haven't I taken my kids trick or treating? After all, I went trick or treating as a kid. The answer goes back to dispensational fundamentalism. When our daughters were just pre-schoolers, we made the decision to keep the girls at home, buy them a bunch of candy, and pass out gospel tracts to the kids who came to the door. As a pastor, I was vocal about it. I encouraged our congregations to do the same thing. Halloween is evil. I knew because I read the Jack T. Chick tracts and comic books. I knew because Dr. Rebecca Brown (who has since been thoroughly discredited as a fraud) warned about opening your soul to satanic influence with the briefest of exposures to Halloween. I knew because Mike Warnke, a Christian comedian who said he had been a Satanic high priest (and was also later exposed as a fraud), warned us all in the 80's about trick or treating. There's no doubt that we are commanded to stay away from the occult. Ouija boards, seances, tarot cards, necromancy, astrology are all condemned in the Word of God. That much is obvious. Dressing your kids up and taking them out to the neighbor's house for free candy? That isn't satan worship. That is free candy and dress up. Unless of course, you dress your kid like Freddy Krueger or Jason from the Friday the 13th series. But what about the jack-o-lanterns the Druids invented to scare off the demons? And the human sacrifices? 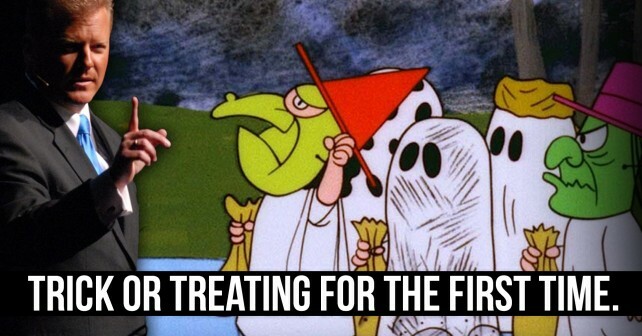 And how trick or treating was invented by bands of Druids who would roam the countryside and kidnap children from castles in the middle of the night as they knocked on castle doors? And the satanists urinating in the candy corn as part of a satanic ritual? First of all, that is Jack Chick (among others), who has been known to have some credibility issues when it comes to his sources. It sells a lot of sensational comic books but this is not real research. Second, none of that has anything to do with kids dressing up in costumes and getting free candy. None of it. As a parent I let my fear of the devil's ability to steal our souls keep my kids from participating in a pretty fun and harmless event. There has been a bit of a discussion lately between a couple of men I respect. Kirk Cameron on one hand is challenging us all to lighten up a bit about the origins of Christmas and our Christmas traditions. In the process he has challenged us as believers to have the best Halloween parties in town. After all, Jesus is Lord of the calendar and He conquered death. Much of the devil with a pitchfork and tail imagery is nothing more than mockery of a defeated foe. Use the day to mock satan. Get the gospel out there in the process. On the other hand, Mike Gendron warns us that Halloween is a Roman Catholic holiday where pagan practices were the M.O. He cites a Catholic Encyclopedia as his proof for these practices. Now, I know Mike fairly well; he has spoken at evangelism conferences I have organized and at the church I am planting here in Syracuse. I have sold his books in my book store. He is a man of God and great integrity. He has provided resources for the Church to proclaim the gospel to a deceived group of people: those who hold to the Vatican's teaching on salvation. I do not doubt for a moment that what he says is true about the superstition surrounding the Catholic observance. I AGREE with him that such observances are pagan and often are part and parcel of the Roman Catholic expression of their belief in areas around the world. That superstition has nothing to do with trick or treating. Neither does Catholicism. I am not sure which encyclopedia Mike is referencing, but there are two major encyclopedias produced by the Catholics in the 20th century. I have had both of them: the older edition was for sale in my store. The newer edition I have as a reference in my personal library. The newer edition, which is far and away much more scholarly, does not get into the pagan practices of Roman Catholics on All Saints Day. It does however painstakingly attempt to trace the origins of the observance. There is some evidence that there was a special holiday set aside to remember the martyrs of Edessa on May 13th. The earliest reference to this observance is in a hymn from 359A.D. It appears to have switched to November 1st sometime around 799A.D. The purpose of the holiday was to honor the martyrs, but evolved later to become an observance of almost any church member who had died (New Catholic Encyclopedia NY: McGraw-Hill, 1967. Vol. I. 318-19). None of this is crystal clear historically speaking. The language of probability saturates the discussion of All Saints Day and Halloween. When I research Halloween in perhaps the most scholarly encyclopedia ever published, the Eleventh Edition of the Encyclopedia Britannica (also for sale in my store: shameless plug) the origin of the celebration of Halloween itself is extremely muddy. Any proof that occult practices on the holiday preceded religious observances is conjectural at best. At the very least, it is unclear. However, the conjecture gets repeated (as is often the case in articles in encyclopedias, almost to the point of brazen plagiarism especially in theological encyclopedias). So much for the pagan roots of Halloween preceding even a Catholic observance. So what are we doing? We choose to believe the conjecture because those who are marketing Halloween focus on the evil side of it. We are keeping away from every appearance of evil. Right? Those who are criticizing Kirk Cameron over his idea of retaking Halloween are a bit disingenuous. If you really believe that trick or treating is supporting witchcraft, what are you doing giving out candy on that night at all? Handing out a gospel tract with the candy does not change the supposed origins of the holiday! By passing out the tract with the candy aren't you doing the same thing you condemn Kirk for? Aren't you trying to reclaim the holiday for Jesus Christ? Yes, you are and I applaud you for it. So what is the harm in taking your kids out to get some free candy? And by the way, those who criticize Kirk for finding meaning in the Christmas traditions that could be made to point to Jesus need to likewise go the whole way. If you think that the observation of the Lord's birth on December 25th is a Roman Catholic attempt to hijack the winter solstice, then pray tell, how do you justify observing it at all? Is this criticism out of Worldview Weekend going to result in a mass exodus of evangelical Christians from the department stores this holiday season? Are Christmas trees in Christian homes going to be relics of a bygone era? Are Reformed dispensational pastors who have "concerns" over Kirk's direction with Saving Christmas going to cancel their Christmas services? Are Christians going to tell their employers, "Ah, skip it. December 25th is pagan. I will be at work tomorrow." Scrooges everywhere sure hope so. While I highly doubt it, I will give them the benefit of a doubt. I look forward to the Reformed dispensational exodus from any observance of Christmas. Watch for it on a podcast near you. Just don't hold your breath. Speaking of Halloween, this is a witch hunt. A witch hunt that is being orchestrated simply because Kirk left behind Left Behind's eschatology and now embraces post-milennialism. This is the same old stuff you hear at dispensational prophecy conferences about the evils of those who don't believe in the same future for national Israel. The difference being that this time, they are accusing Kirk of preaching a false gospel. Ironically their "concerns" for Kirk may have their own origins in a false gospel. You cannot divorce dispensationalism from its easy-believism roots. Dispensationalism held to easy believism from its academic beginnings which is why MacArthur had to write a book (The Gospel According to Jesus) to combat it as a dispensationalist. Extra-Biblical rules were instituted by dispensational local churches to protect the products of the sinner's prayer. The gospel message they responded to was man centered and didn't call for nor did it expect true repentance. They had to get goats to act like sheep. If Christianity could be defined as people who do not listen to rock music, wear suits and dresses to church, wear their hair in a certain style and skip Halloween all you had to do was make those unwritten rules the expectation and you might be able to conserve some evangelistic fruit. Of course, it doesn't work. Unbelievers who have responded to a false gospel will not be preserved by extra-Biblical rules. They abandon the faith--not because they took their kids trick or treating--but because they were never regenerated. The doctrines of the Reformation fear nothing from trick or treating. Remember, "the prince of darkness grim? We tremble NOT at him?" The doctrines of dispensational fundamentalism (i.e. easy believism) do. They ought to tremble because their gospel could not save a flea. For some reason, those who are in the Reformed dispensational camp have not allowed their theology to inform their consciences. Some habits die hard. They have rejected the easy-believism without rejecting its manmade rules. At this point you have an option. You can continue to hold on to the rule making or you could just stop it. There is no solid evidence that trick or treating is a soul damning activity. If you choose to remain the weaker brother in the face of a lot of evidence that your conscience is poorly informed and continue to insist that every Christian bow his knee to your conscience, you are a spiritual tyrant who would probably spiritually abuse your followers if you were in the position to do it. So stop it. There are alternatives. You could rejoice that Christ has conquered death and that satan is a defeated foe who happens to be on a leash that God Himself holds. You could take your kids out to meet the neighbors. You could enjoy the excitement of seeing your kids run up to a house that has its porch light on and see them run back to you chattering about how much candy your smiling neighbor gave them. You could smile with your kids. You could remember being a kid. You could give your neighbors a tract. You could praise God that your kids are having innocent fun. And you could use Halloween to explain to your kids the defeat of satan and the triumph of the gospel. THAT'S discernment. That's freedom. That is also the way the Lordship of Christ works in a family. In light of the recent controversy regarding what has long been labeled “social justice” and the response from the crafters and signees of “The Statement on Social Justice and the Gospel”, it is necessary for every teaching elder in a local church to carefully consider his own position. Since God is a God of justice (Genesis 18:25), it behooves pastors and local churches to consider how they are going to relate to the issue of justice as Biblical congregations. I do not believe it is enough to sign a blanket statement which has some very grievous omissions and language which is too general to be helpful to the issues at hand. This statement is solely my statement (Pastor Jon Speed) written for Christ is King Baptist Church in Syracuse, NY. It is written for the purpose of explaining why I did not sign the recent statement by providing a clear statement on my own position on the issues. Martin Luther said that church history is like a drunk man who falls off of one side of his horse, gets back on, and then falls off of the other side. It is my opinion that the recent brouhaha over the issue of social justice represents exactly the present discussion regarding the issue. The positions stated are two ends of an extreme pendulum swing. There must be a third option, an option where pastors seek to stay on the horse. By the grace of God, I hope to be Biblically consistent without identifying with either side of the pendulum. Racism exists as long as sin against a holy God exists. Hatred of one another is characteristic of total depravity (Romans 3:13-17). While the term “racism” or “race” does not accurately represent the truth that we are all “one blood” (Acts 17:26)—one family created in the same image of God (Genesis 1:26-27)—it does conveniently describe the hatred that exists between people groups which is based on nothing more than the color of one’s skin. Racism is largely propagated by local and national news media outlets which emphasize crimes in urban centers while de-emphasizing the same kinds and frequencies of crimes in rural and suburban neighborhoods. I have heard Christians in Onondaga County, NY joke about riots starting in communities like the South Side of Syracuse (an African American community) because Syracuse University lost in the Final Four a few years ago. Riots did not happen. This is also why Christians from a suburban church which supported our church plant were hesitant to attend a prayer meeting or even have a lunch meeting in our neighborhood (The Valley of Syracuse). When they did, the comments made about the “dangerous neighborhood” we chose to live and serve in were offensive to me as a member of the neighborhood. This is a neighborhood I have raised my family in for the last seven years and I love it. Finally, this is also why some suburbanites will not come to our book store, which is located within walking distance of the Onondaga Nation (Native American tribal land). The media and urban legend has it that the Nation is a dangerous place to be and I have heard some people say that they will not come here because of the “danger” (although I have never been scalped). Furthermore, many of the Onondaga people are my friends and customers. I am offended for them. I can only imagine what they think. Institutional racism has existed in this nation in our history, some of it recent. Of course, American slavery is the most obvious example. American slavery was nothing more or less than kidnapping and those who were involved in it would have born the consequences of that sin in a just society (Exodus 21:16; Deuteronomy 24:7). The practice of “red lining” neighborhoods by banks and other financial institutions is another example. Urban African American neighborhoods were marked on bank maps with a red border to remind lenders not to grant mortgages to residents in those areas. In more recent times, the neighborhoods were erased from maps altogether (2015). This is a violation of the command of God regarding just balances (Leviticus 19:35-36). The current practice of racial profiling by law enforcement is another. The Law of God never commands that civil authorities should anticipate crime, much less based on the color of someone’s skin. 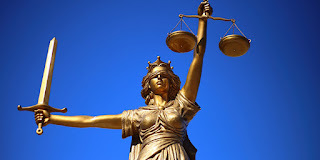 The Law of God deals with penalties when real crime is actually committed. But there is an even more despicable form of racism. It is the acceptable racism that often exists where it should never be named--within the Church. It exists where racial jokes are told within family and church circles and are left uncontested because the tellers “are from another generation”. It exists where interracial dating and marriage are discouraged because “those people are just different.” Where pastors and other ministry leaders quit their positions because interracial children and minorities are involved, it exists. It exists when minorities are broad brushed in political conversations as “lazy”, “welfare recipients”, and “dangerous to America”. It exists whenever a professed brother or sister in Christ will not consider the claims of racism of another brother or sister in Christ merely because of political ideologies. It exists every time the presence of minorities in a worship service make the membership visibly uncomfortable. It exists every time we assume that another brother or sister in Christ is a default racist because of the color of his or her skin. I affirm that racism exists both within and without the Church Visible. It exists in the words, thoughts and actions of sinful men. I affirm that racism is a destructive evil which can only be remedied by the gospel of Jesus Christ. As it is essentially hatred, it is a form of murder (Exodus 20:13; 1 John 3:11-15), a sin for which Jesus Christ died (1 Corinthians 15:3). I affirm that whenever I have been guilty of it, I have sinned and must repent. I deny that there is a permanent remedy for racism apart from the application of the gospel of Jesus Christ and obedience to the Law of God. In Jesus Christ, there is no division over race (Ephesians 2:11-22). The slaughter of millions of unborn babies in the name of convenience is a sin that has been passed over by social justice advocates and many of those who oppose them. God regards the intentional death of a baby in the womb as punishable by death (Exodus 21:22-24). He knows the names of babies in the womb before they are conceived (Jeremiah 1:5). It is the duty of Christians everywhere to intervene for the lives of these precious children (Proverbs 24:11-12). Abortion advocates are engaged in a genocide of the African American race, statistically speaking. If we love our unborn neighbor, we will intervene. We must proclaim the truth that abortion is murder (Exodus 20:13), both within our churches and to this culture of death. I affirm that we must make every legal effort to end abortion now, simply because it is right. I affirm the right and duty of local magistrates to criminalize abortion in their respective municipalities. I affirm that a gospel presentation coupled with an offer of real help to abortive parents is the right way to intervene at the abortion clinics. I deny that pro-life incrementalism is an ethical or just methodology to end this slaughter. I deny that overturning Roe v. Wade will end abortion on demand in the United States since all it would take to reinstate abortion would be actual legislation making it legal on the Federal level, which to this point has not been done. It could be done very quickly. Socialism is theft (Exodus 20:15). I deny the idea that promoting thievery is a valid way to approach issues of race. I affirm capitalism (2 Thessalonians 3:8-12). Feminism exists as long as sin against a holy God exists. The desire of Eve to rule over Adam passes on to every woman under the transmission of original sin from our representative heads of the human race (Genesis 3:16; Romans 5:12). God, in His Sovereignty, has established that the creation order of man and woman has permanently placed men in places of authority and women in submission in the home, in church and in government (1 Timothy 2:12-14; Ephesians 5:22-24). I affirm that God’s clear revelation on this issue is just and transcends cultural norms. I affirm that the Lord Jesus Christ values women and their role in the local church as disciplers of younger women (Titus 2:3-5). I deny that any attempt to place women in authority over men is just or prudent. Such an effort is a sure sign of the judgment of God on a culture (Isaiah 3:4). I further deny that the example of Deborah the judge is anything other than a historical record of what happened to Israel under divine judgment and should not be considered normative for the Church (cf. 1 Timothy 3:1-7). God created male and female (Genesis 1:26-27). There are no other genders. In so doing, He established the institution of marriage (Genesis 2:18-25), forever defining it as one man and one woman for life (Malachi 2:16). Homosexual marriage is an abomination and merits the wrath of God as evidenced by the example of Sodom and Gomorrah (Genesis 19) and the clear teaching of Romans 1-2. I affirm the Biblical definitions of gender and marriage. I affirm that my homosexual friends can find grace and forgiveness through repentance and faith in Jesus Christ. When they do, I will affirm them as brothers and sisters in Christ. I deny that either marriage or gender is fluid. I call the American evangelical church to repentance over its compromised view of divorce and remarriage, including and especially the Reformed leaders who have redefined marriage to include remarriage under certain circumstances. In so doing, we have encouraged a form of polygamy within our own churches while calling the culture to repent over homosexual marriage (as it should). The Law of God as it is revealed in the first five books of the Bible is the starting point to guide us regarding issues of government and law. While the United States is NOT Israel, there simply is no other place to look, in context. The evaluation of candidates and policies should be viewed through the lens of the Law of God. Jesus Christ summed up the entire Law with the theological statement that we must love the LORD our God with all of our heart, soul, mind and strength. He summed up our ethical responsibility before God with the statement that we must love our neighbor as we love ourselves (Matthew 22:36-40). The New Testament reveals the standard by which human government is judged. According to Romans 13, human government’s duty is to bear the sword against the evil doer. The Word of God defines good and evil by the standard of the Law of God. Therefore, the Apostle Paul presupposes that good government knows the difference between good and evil, which further presupposes knowledge of the Law of God. He also presupposes that good government will literally “terrorize the evil” by its application of capital punishment on the criminal who is worthy of it, as defined by the Law of God. While it is NOT the primary duty of the Church to address political issues, it is at least a secondary duty under the ethical command to love our neighbor as ourselves. Further, Jesus Himself instructed His disciples to teach disciples to “observe all things whatever I have commanded” (Matthew 28:18-20). The political duty of the Church does not end at the voting booth. It includes instructing elected officials as to their responsibility before the King of kings and Lord of lords. The job of the Church is to speak prophetically to elected officials and assist in crafting laws that honor the Giver of Law. Applying these principles to the current political scene reveals quickly that no political party accurately represents a Biblical standard of justice. A cursory glance at evangelicalism shows that there is an inordinate idolatry of big government, a trusting of horses and chariots rather than in God and a supporting of evil that good may come (Psalm 20:7; Romans 3:8). In short, the prevailing attitude in evangelicalism is Statism: a trust in the State that should only be given to God. More specifically, this Statism is combined with an allegiance to the Republican Party which defies all logic considering the record of that party on issues evangelicals care about like abortion on demand and homosexual marriage. It is this prevailing attitude, coupled with a misinterpretation of Romans 13:1-7, which has given the government (especially in the case of Republican politicians) carte blanche by many evangelical leaders to do whatever it likes. In their view, our only responsibility is slavish obedience, even when we must choose to obey men rather than God (cf. Acts 5:29). Therefore, the execution of citizens by law enforcement (often relating to the color of their skin) and the inevitable acquittal of the officers in question must be accepted as just. In their view, we do not owe even brothers and sisters in Christ a word of defense when they are the targets of such behavior, much less unbelieving neighbors. Therefore, following such logic, racial profiling by police departments must also be accepted even though the Law of God never advises suspecting one’s neighbor until an actual crime has been committed. If we love our neighbor we will find ways to speak up about these (and many, many other) issues. We can do this without sacrificing the primacy of the precious Gospel of Jesus Christ for the same reason we can chew gum and walk at the same time without choking to death. Multi-task. I affirm this understanding of the relation of Biblical law and government. I deny the idea that political involvement and robust Christianity are mutually exclusive. I deny that the Republican Party is the sole option for Christians who desire to be Biblically and ethically consistent. I deny that we must vote for a lesser of two evils in order to save our own skins. I deny that it is ethical to vote for men of questionable character in order that good may come. The Gospel of Jesus Christ declares that Jesus, the eternal Second Person of the Triune Godhead became flesh and bore the sin of His people to the Cross (John 1:1-18; 1 Corinthians 15:3). He died and rose again from the dead (John 19-20). When the Spirit of God regenerates sinful man with new life, they are given the gifts of repentance and faith (2 Timothy 2:23-25; Ephesians 2:8-9). They are justified by faith alone in Jesus Christ alone (Romans 5). They are sanctified (Romans 6-8). This message is not a pietistic expression of personal salvation which has no effect on the culture. As believers whose old lives are gone and replaced with a new life, everything changes (2 Corinthians 5:17). In the Sovereignty of God, when the gospel finds large scale response in any nation, one can expect that the predominant sins of that nation will be reduced simply as a matter of mathematics. This is a recurring theme in the history of the Church. It has been evidenced during the Reformation, the First and Second Great Awakenings, and the missionary and evangelism efforts post-World War Two, to cite only a few examples. The missionary advance of the 19th century further shows the redemption of entire cultures in places like Africa and Asia, at least temporarily. To deny this is to deny the historical record and a vast literature on the subject. Further, this is the very nature of the Kingdom of God. Isaiah 9:6-7 makes it clear that from the time of the Advent of the Messiah to the consummation of His Kingdom, “…Of the increase of His government and peace there shall be no end…”. Jesus taught that the Kingdom was like leaven, which spreads by nature until it consumes all (Matthew 13:33). Of course, this will happen by the spread of the gospel of Jesus Christ. As we obey the Great Commission people repent and believe the gospel. They are baptized and they are taught to observe all things the Lord has commanded (Matthew 28:18-20). As they are taught to love their neighbor as themselves and as they study the Law of God, they discover righteous principles to conduct their lives by and the resulting transformation of individuals results in a transformed culture. It is the nature of salt and light (Matthew 5:13-16). While some have tried to distinguish between the power of the gospel in sanctification and the goal of redeeming culture it appears to this writer that this is a distinction without a difference. It is obvious that the primary goal of the Church is the proclamation of the gospel. Such a goal will result in cultural transformation as the power of the gospel plays out in the lives of individuals and as Christians obey the Word of God applying the Law of God to issues of governance and policy. I affirm this understanding of the relationship of the gospel to culture. I deny any monastic, pietistic attitude which ignores the evils in a culture because our duty is theological rather than ethical. Such an attitude is unknown in the Scriptures. Babies Are Murdered Here: RELEASE!!! Watch it now. Why do bad things happen to good people? Kirk Cameron's new movie, Unstoppable, answers this age old question both Biblically and beautifully. The movie is Biblical, using the scope of redemptive history as an explanation of how God is in the business of redeeming the world from the curse. In that process, He has reversed the curse of death at the cross and paraded it in the resurrection. This process is "unstoppable". What Adam failed to do in the Garden of Eden (crush the head of the serpent that came to deceive Eve in his role as care taker of the Garden) Jesus did at the cross (Genesis 3:15) when He crushed satan's head on behalf of His Bride. What this means for people passing through tragedy and suffering is significant. It means that when we bury a loved one who is in Christ it is not the end. For them, it is the beginning. This is an old story. In fact, it's 2,000 years old. You might have heard of it. It's the Gospel. What makes this film unique is the beauty in which this story is told. The movie is visually striking. So striking, that I will venture to say it is the most beautiful movie that I have ever seen out of a Christian production company. There are moments in the movie that take your breath away--the depictions of Adam and Eve in the garden, the depiction of Cain killing Abel, and some of the b-roll footage. Simply put, it's art. This movie has raised the bar for documentary type films and not just for Christian documentaries. Hollywood may not recognize it but if Christian producers can consistently make documentaries as visually pleasing as this one, Hollywood's opinion will be irrelevant. In fact, Hollywood itself will be irrelevant. The inspiration for the movie is the death of a teenager who Cameron met through his Camp Firefly ministry. His sincere depiction of the illness and death of this young man as well as the reaction of the family to his death (including footage from the funeral) is a powerful testimony to the truth that Cameron lays out in the film. It is part of what makes the film beautiful; a glimpse into the life of a family who has faced tragedy head-on and triumphed because of Jesus Christ and His Gospel. My wife, Kim, wept through much of the movie. We are coming up on the one year anniversary of the death of my mother-in-law. She succumbed to melanoma cancer on October 9, 2012. As a family we are all dealing with the inevitable sadness which comes when you face such an anniversary. Additionally, we have been passing through a difficult season this past month as we have received news of the moral failures of a couple of friends in ministry. Unstoppable has been a great reminder about the triumph of the gospel. In spite of our personal loss and personal pain--and perhaps because of it--the Lord is redeeming this world unto Himself. Go see Unstoppable. A second showing is scheduled for October 3rd. Last night my wife and I went out to a small theater in Manlius, NY to watch the latest Ron Maxwell film (Gettysburg, Gods and Generals) on the Civil War. When we got there we were surprised to learn that the screen writer for the movie (Bill Kauffman) was there and going to do a Q&A afterwards. This isn't Hollywood, this is central New York State. What in the world was he doing in Manlius? So, this movie has more than the usual historical interest for me. I had always hoped that the next Ron Maxwell film I would see would be the film version of The Last Full Measure, the conclusion to the Civil War trilogy by Michael and Jeffrey Shaara. Rumor has it that we'll never see that since Ted Turner, the financier of those projects, was less than impressed by Maxwell's honest depiction of Stonewall Jackson in Gods and Generals. After all, he is depicted as a somewhat eccentric but a very much Christian man. Since the movie bombed at the box office, he was probably even less impressed. Nevertheless, movies that are actually good artistically regularly bomb at the box office. You cannot trust American movie-going sensibility to define art. Since making epic films requires epic money, we will probably have to be content to read the book. This movie is different than any Civil War movie you have ever seen. The reviews that are out right now, just a couple of days since the release, are critical because the movie starts slow. This was intentional on the part of the producer. You are about to watch a movie set in Oneida County, NY in 1862. The pace of life in general is slower than 21st century America. One of the great things about independent films is that they are not bound by Hollywood restrictions on art. Copperhead is a beautiful film and the pace is part of what makes this art and not a mere blockbuster. What you see in Copperhead is the effect of the War on a northern community which is divided over the Constitutionality of the Civil War. Abolitionism was strong in this part of the state. It's not depicted in the movie, but Auburn, NY would become the home of Harriet Tubman. Frederic Douglass was based in Rochester, NY, as was Susan B. Anthony. Gerrit Smith, one of the financial supporters of John Brown's (of North Elba, NY) Harper's Ferry raid was from Peterboro. Obviously northern support was strong in this northern region, but there were Democratic (as in the party, not the ideology) dissenters named Copperheads. They were so-called because they were considered dangerous, like the snake. They embraced that label and began wearing the Liberty symbol clipped from copper pennies on their lapels. They did not necessarily support slavery, but they opposed Lincoln's unconstitutional measures during the Civil War (recruiting young boys to fight, the draft, unilaterally declaring the slaves free without support from Congress). For anyone who has grown up in this part of New York State, this movie is a bit of a shock to the system. We were taught that Abraham Lincoln was a hero. We believed that the abolitionists were always level headed and right thinking activists. Our known Underground Railroad sites are the pride of historical societies in every upstate county. I took pride in the fact that a man named Joshua Speed (no direct relation that I can trace) was Abraham Lincoln's best friend. Copperhead shows that the ugly side of human nature can manifest itself even in righteous causes. These causes can lead believers to forget one of the most basic teachings of Jesus. The theme is repeated by a couple of the characters: "Whatever happened to 'love thy neighbor'?" I hate reviews that give away plot details so I am going to refrain from doing that here. I do want to make some comments on an issue that is parallel to 19th century American slavery. I've been giving this some thought lately. I am co-producing a film with Crown Rights Media called Babies Are Murdered Here. The film is a documentary on one of the great evils of our day: abortion. Over the last couple of years there have been many in the pro-life movement who have seen the parallels between abortion and American slavery and have found inspiration in the abolitionists. I, and many others, are unequivocal in our goal: we want to see abortion end. We make no apologies for that and work tirelessly toward that end by producing media that will accomplish that goal. Why? Like the abolitionists of the 19th century, we believe that it is immoral to rob the defenseless of life. We believe the Bible has clearly spoken about the value of human life in the womb and that to take it is premeditated murder, "with malice aforethought." We believe that abortion should be criminalized. Not a popular message, to be sure. My family and I have been threatened, cussed out, and otherwise harassed. A popular leader IN the pro-life movement threatened to call the FBI on myself and Crown Rights Media. Churches have opposed us. What many do not realize is that even in the pro-life world, few are willing to take an unequivocal stand. Most are incrementalists who believe, as many did in the case of 19th century slavery, that abortion ought to be gradually phased out using legislation that limits abortion but not ends it. We do not believe that murder should be phased out any more than anyone believed that the Nazi Holocaust should have been gradually phased out. As you might imagine, we're kept on the fringe of the pro-life movement and that is as we would have it. We don't identify as pro-life. We identify as anti-abortion. But here's the problem. What does it say about my Christianity if I am so passionate about ending abortion that I am willing to forget the second greatest commandment to love my neighbor as myself? Now we will quickly point out that we ARE loving our neighbor enough to call them to stop murdering their babies. And that is true. the pro-lifers who I don't agree with? the churches and other believers who have actively opposed what we do? the abortionists and their staff? the men and women who are brazen in their pursuit of abortion? Do I love them? Do they know it? If I do love them they will know it. In Copperhead, you see activism on both sides run amok. You see activism's potential to destroy families, communities and churches. I will continue to stand in front of abortion clinics with signs that warn, Babies Are Murdered Here. I will continue to preach the gospel to abortionists and the mothers and fathers who are paying them to murder their own sons and daughters. I will continue to call the pro-life world to repentance over its pragmatism. But if I cannot do it with genuine care for those who oppose me, I should stop. The Bible still says, "If I speak in the tongues of men and of angels, but have not love, I am a noisy gong or a clanging cymbal. And if I have prophetic powers, and understand all mysteries and all knowledge, and if I have all faith, so as to remove mountains, but have not love, I am nothing. If I give away all I have, and if I deliver up my body to be burned, but have not love, I gain nothing." (1 Corinthians 13:1-3). To take it a step further, am I willing to forgive those who oppose me? Jesus said, "but if you do not forgive others their trespasses, neither will your Father forgive your trespasses" (Matthew 6:15). Am I willing to forgive the abortionists who have swerved their cars at me and my children? Am I willing to forgive the pro-life leader who threatened to call the FBI? Am I willing to forgive the pastor who told me that I cannot use his church's parking lot to park my car as I stand in front of the abortion clinic across the street from his church? By God's grace, and only by God's grace, I am. That may chafe a little bit with some of my friends. Remember this. While Jesus was being nailed to the cross, He repeated over and over again, "Father, forgive them for they do not know what they do" (Luke 23:34). While they were nailing Him to the cross! Those Roman soldiers were not repentant at that moment. Jesus' attitude was still forgiveness even though He did not grant it without their repentance. Copperhead ought to be a sober reminder to all of us who wish to abolish abortion that the commands of Scripture are full orbed and not limited to our cause celebre. It is a reminder that while we ought to be very passionate about abolitionism we cannot let it consume us to the degree that we allow it to override our love for our own families, our love for our neighbors and even our love for our enemies. This is a MUST watch. Whether this movie IS a sober reminder or not will depend on whether or not you will seek it out or just keep paying for super heroes and teenage vampires. What have you been doing for the last twenty years? No one flipped a switch or pushed a button to get this culture to go into immorality and relativism overdrive. We've been too busy with building programs. Church softball leagues. Gathering men together to get in touch with their inner child\man\woman\extra terrestrial. Gathering women together to get inner healing. Gathering children and teenagers together for pizza and a movie. Trying to prove the Bible. Ecumenical worship services with heretics and apostates. And on and on, blah, blah, blah, blah. Man up. Pastors, it may not be too late. A dark age may yet be avoided. Teach your people to study the Bible, yes. And then teach them to not only live it in their home, family, job, etc., but in the public forum. Show them how to engage the postmodern thinking of our day with truth. Get a spine. Get up out of the study for an hour or two each week and go to your local college campus. Talk to students about the gospel. Go to the abortion clinic. Tell people not to murder their baby. Offer them help. Go to a gay pride parade and talk to the people there. Give them the gospel. Bathe the whole thing in prayer. Pray. Call your church together to pray. Start up that archaic Wednesday night prayer meeting again. Read. Read the Bible on your knees. Read Ravenhill. Tozer. Lloyd-Jones on revival. Iain Murray on revival. Jonathan Edwards. Whitefield. The Puritans. Bonhoeffer. Repent. Stop waiting for a rapture because "look how bad everything is" and start preaching and living as if Jesus is the King He says He is. Do it, not to save our culture, but because it's what we should have been doing all along.